(Radioactive?) Spider-Gwen has been one of my favorite comics for quite a while now, but if I’m being honest, there was a time in the build-up to Gwenom and a little after that didn’t hold my attention as much. Gwen just seemed to spend so much of her time down in the dumps that it got a little tiresome, even if her feelings were justified. It was nice to finally see her get angry in the last issue, and it’s even better to see a different side of Matt Murdock, who was already such a great villain. Without him, this series just wouldn’t work. Spoilers ahead. At the end of the last issue, we saw Gwen reveal herself to Ben, leaving me to wonder what exactly she intended to do after. Now, we see that she has actually revealed her identity to May Parker and the rest of the Mary Janes as well. To the benefit of the story, though, this really doesn’t take up much of our time, but it does give Ben a great moment in which he tells Gwen that it’s her turn to suffer. Matt Murdock is the one who really gets the spotlight in this issue. When Officer Rogers was previously attacked by his ninja’s, I assumed he was dead and the scene’s only purpose was to show that the Kingpin had no problem with killing, something we already knew, and I’m glad that’s not the case. What we get instead is him serving as Matt’s audience to share his origin story with. The things we do learn from this are great, but what’s really interesting is his more recent developments: why he treats Spider-Woman the way he does. Writer Jason Latour has done a better job than I could have hoped for in letting the Earth-65 Kingpin grow as the villain that we all love to hate. It’s also great to see the parallels between Gwen and Matt in a way that’s easy to pick up on but not shoved in your face, too. The reason Gwen spills the beans to her band mates and neighbors is because she’s considering giving up on her civilian life. Matt didn’t have much of a choice in giving up his, and it freed him, but in a way that only allowed him to become something worse and bound him to something else. I think fans of this book will agree that they’ve never been more eager to see Gwen confront him. Artist Robbi Rodriguez and colorist Rico Renzi are killing it. No surprise there. I really loved to see Matt being blinded by the chemicals on his own mother’s hands, followed by him calling to her in complete darkness. It exceptionally conveys how traumatic the experience must have been and weighed on his mind. There are a few things that could have been cleaned up a little, though. Namely, Ben’s forehead. It’s just too big in some places. Have you ever seen a picture of a person where somebody photoshopped their face to be smaller but kept their head the same? It’s kind of like that. And if I’m allowed to talk about the cover of the next issue, Matt looks like he may want to see a doctor about a back brace. These complaints are really few and far between, though. 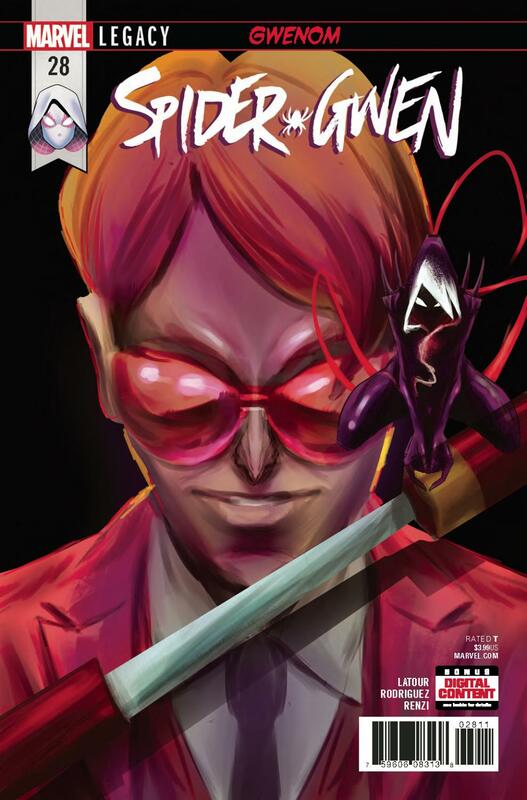 Rodriguez and Renzi are a match made in Heaven for Radioactive Spider-Gwen – just oozing with style. Acts of violence (usually murder) stick out on each page by genius use of silhouettes and sound effects. Lighting brilliantly compliments the tense atmosphere of a conversation between loved ones just as well as that of a ninja slaughter. I will never not love to look at a Spider-Gwen book.